Led by head coach Nick Saban, Alabama cruised to a 14-1 record and their 16th national title in 2015. The Tide’s only blemish was a Week 3 loss at home to Ole Miss. This, however only served to fuel the Crimson the rest of the way as they ran the table and dominated their opposition, including lopsided victories over Top 10 teams like Georgia, Texas A&M and LSU in the regular season. Earning the No. 2 seed in the College Football Playoff based on their SEC title, they defeated No. 3 Michigan State 38-0 in the semi-final and then defeated No. 1 Clemson in a classic final that saw the Tide prevail 45-40. True freshman Calvin Ridley made an immediate impact for Alabama as a wide receiver, leading the powerful SEC Conference in receptions with 89. Ridley notched two touchdowns and 138 yards receiving in Alabama’s 38-0 victory over Michigan State in the College Football Playoff semi-final victory. 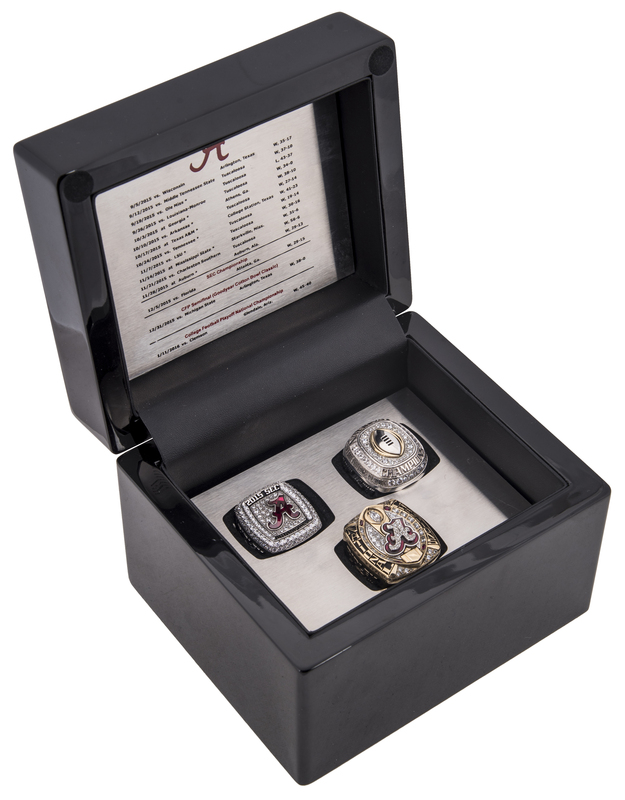 Presented here are a collection of three rings that were presented to Calvin Ridley as a member of the 2015 Alabama Crimson Tide’s national championship team. For winning the SEC title game against Florida, Ridley was presented with this silver Jostens SEC title ring. This ring features the Alabama “A” in a ruby stone with “2015 SEC CHAMPIONS” surrounded by 34 cz stones in a center square. Surrounding the center square are 85 perimeter cz stones in two rows. This ring weighs approximately 44.7 grams and is a size 10 ½. One shank has the Alabama “A” in raised relief with 29-15 and “F” for Florida with the SEC logo, CHAMPIONSHIP 2018 and ROLL TIDE. The other shank has “RIDLEY” with the crimson Alabama helmet and Ridley’s number “25” and two banners that read “SEC” and “CHAMPIONHIP” with a raised “3” at the bottom. On the inside of the ring is etched with the Alabama “A” and a rope with the slogan “HOLD THE ROPE” and the Jostens LTM copyright. The next ring is a large gold ring that features the Alabama “A” in cz stones outlined in a ruby setting. A football shaped center has the CFB trophy with a large cz stone at the top with six cz stones on the perimeter of the football shape and four individual ruby stones on the corners. “NATIONAL” and “CHAMPIONS” run vertically on each side. The left shank has “RIDLEY”, the Alabama and Clemson logos with the score “45” and “40” underneath. Centered between the score is a “NATIONAL CHAMPIONS 2015” shield, with the number “3” on the bottom. “ROLL TIDE” is above “RIDLEY”. The opposite shank has “2015” with the Alabama and Michigan State logos and the score “38” and “0” with the “Good Year COTTON BOWL” logo in the center and Alabama’s record “14-1”. On the inside of the ring is engraved the 16 national champions won by Alabama. This ring weighs approximately 63.6 grams and is a size 10 ½. The final ring presented to Ridley was a silver College Football Playoff National Champions ring. The CFP raised logo football is on the center surrounded by 26 individual cz stones. “NATIONAL CHAMPIONS adorns the top outside, with seven cz stones running vertically on each side. The bottom of the outside has “COLLEGE FOOTBALL PLAYOFF” reads on each side with six cz stones on the top and bottom center. The left shank has “ALABAMA 45 CLEMSON 40”, an Alabama “NATIONAL CHAMPIONS 2105” shield and “ROLL TIDE” on the bottom, all in raised relief. The opposite shank has “RIDLEY 2016” with the CFB logo in the center in raised relief. The inside of the ring has engraved “Calvin Ridley” and the “SEW” copyright. This ring weighs approximately 75.1 grams and is a size 10 ½. Finally, these three rings are housed in a 5 x 6 x 4 ½ inch Jostens black gloss presentation box. This custom box was designed to hold all three rings in a beautiful presentation style. 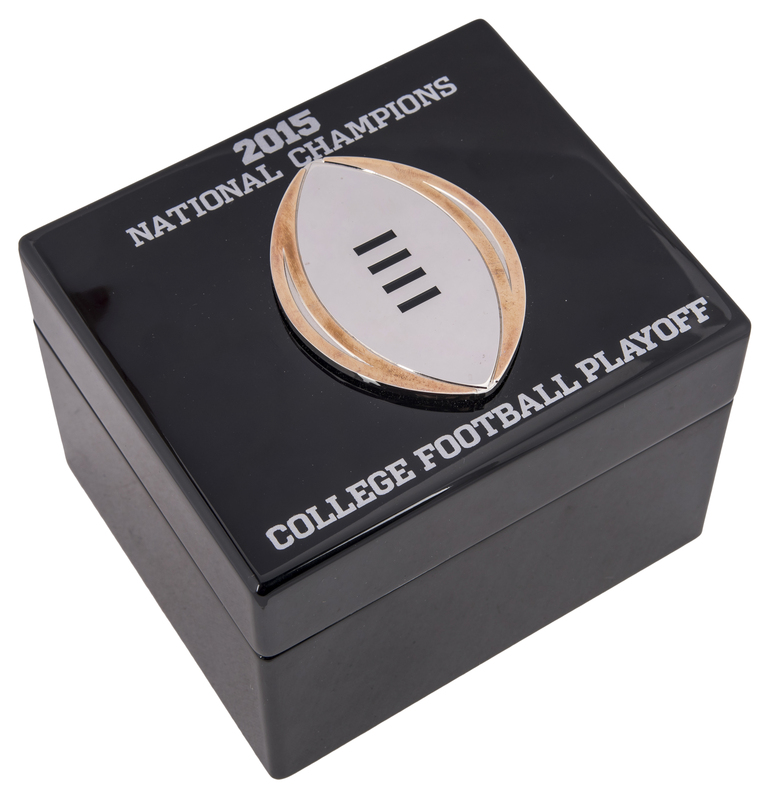 The top of the box has “2015 NATIONAL CHAMPIONS COLLEGE FOOTBALL PLAYOFF” etched in white with a raised football. On the inside is a plate that has the Alabama “A” logo in red with Alabama’s complete schedule and results. This is a terrific collection of championship rings from the premier college football program in America.